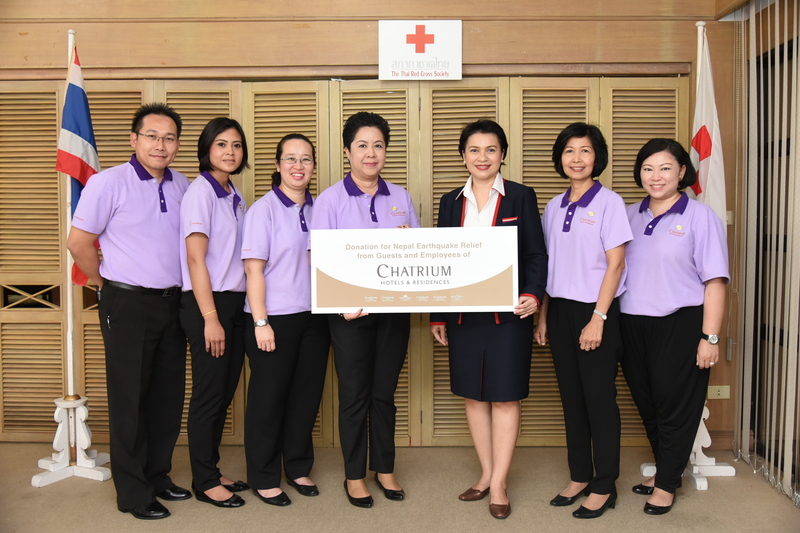 Bangkok: June, 2015, Chatrium Hotels & Residences donated Baht 117,666.75 cash to the Nepal Red Cross for Nepal earthquake relief through the Thai Red Cross Society. After a devastating earthquake struck Nepal causing widespread destruction and led to 8,000 people losing their life and the injured numbering nearly 20,000, Chatrium Hotels and Residences began a campaign for Nepal earthquake relief by creating fund raising activities. The total of collected money of Baht 117,666.75 came from a variety of sources including: Chatrium cap sales, garage sales and donations by Chatrium hotel guests and Chatrium employees in Thailand. “We are proud to be a part of the world that could help Nepal recover their country and help the homeless and injured people in Nepal. We also greatly appreciate all guests and associates for their generous donations to support the massive earthquake relief and rehabilitation”, said Ms. Pariyarat Chunlakittiphan, Corporate Director of Human Resources of Chatrium Hotels and Residences. The Thai Red Cross Society will forward this donation cash from Chatrium Hotels and Residences to Nepal through the Thai Red Cross Society and International Federation of Red Cross and Red Crescent Societies (IFRC).